Hi fellow inkophiles. 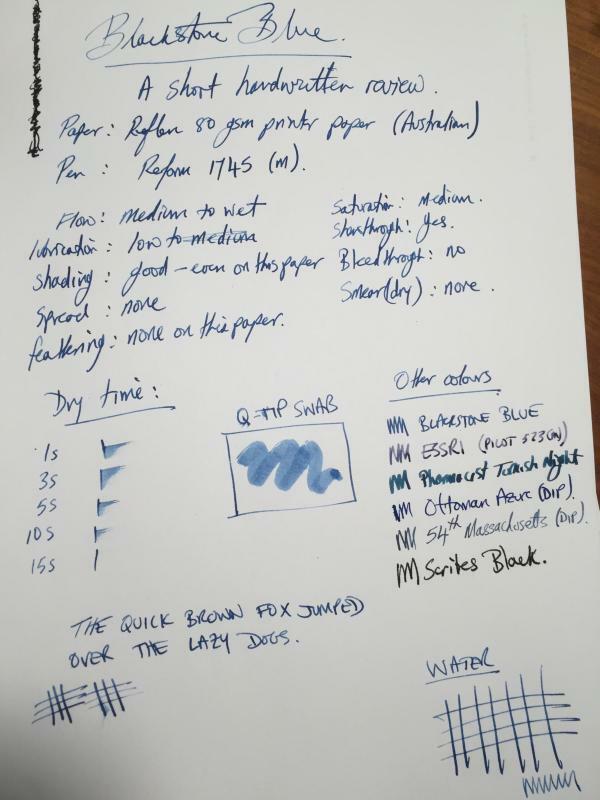 I was excited to see that Blackstone inks are now available from justwrite.com.au, just black and blue so far. I ordered a sample of the blue a couple of days ago and it's just arrived. I am a bit tight for time tonight so without any further delay here's a quick review. In summary it's a pretty blue with some nice properties - no feathering, good flow and shading. PS: The Rhodia sample I hit with about 20 seconds of water on the cross hatching at the bottom of the sheet. I'd call the ink a little water resistant. Edited by rickygene, 04 May 2015 - 11:57. CONGRATS! How do you like it. I will try the ink out over the next few days in some different pens and on Tomoe River paper to see if there is any sheen. It probably deserves a look at from one of the more dedicated uber reviewers on here. (Ie. You, Sandy, Vis, Saskia, LGSoltek, and the many others). I only have a 5ml sample (less one ml) but I can send it to you if you want to try it out? There is a teeny tiny bit of sheen, if I angle it out the window towards the sun and use a loupe. Hey Dcwaites. Thanks for that. The ink looks darker and more saturated in your review. 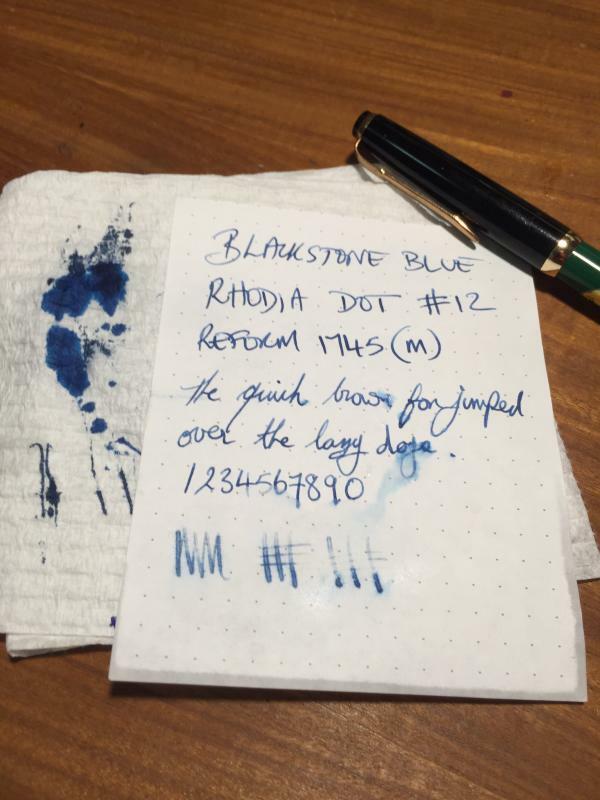 I think the Reform 1745 I used is a fairly fine nib for a medium and is not very wet. I definitely saw some shading with the pen and paper combo I used. Like I said earlier I'll try out some more combos over the next week. 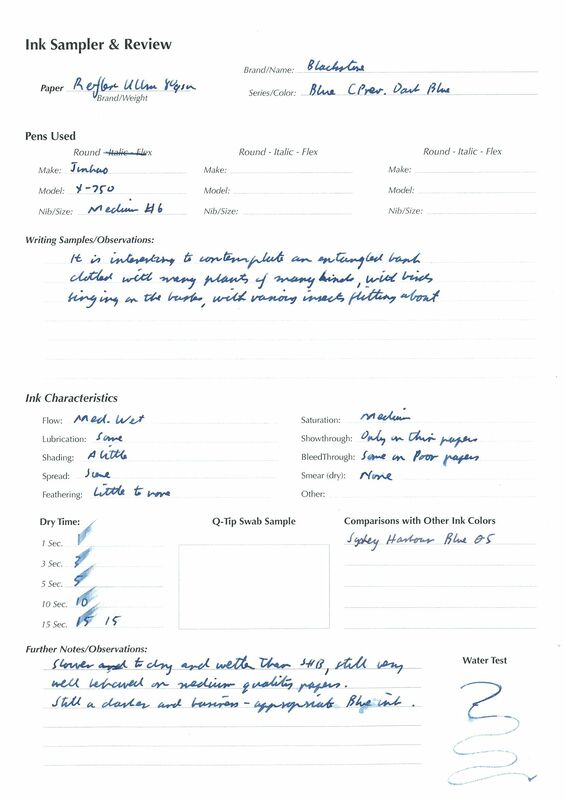 I assume that this ink is related to the inks that Amber and her group were testing in the Susemai reviews. They seemed To have some very nice properties and a good range of colours. I really hope Blackstone keep making more inks. If this ink is an example of what they can do; then I think they are likely to be successful. It'll be nice for us Aussies to be able to buy inks without paying more for postage than the price of the ink! Edited by rickygene, 05 May 2015 - 01:07. 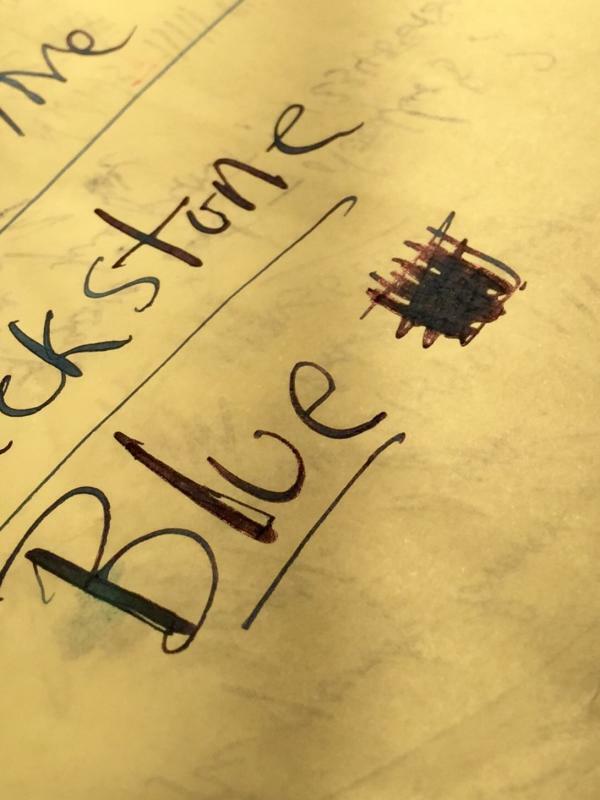 I've been using the Blackstone Blue for a couple of weeks. It shades really well on Tomoe but I find there is very little sheen, even in wet writers. It behaves very well and cleans easily, so I put it in my newly acquired 1927 A. J. Barker BCHR. It looks very appropriate, quite traditional in appearance. I do find that it fades slightly over a few days. I am impressed with it overall. They are the words I was looking for to describe this ink. It has a really old fashioned look like the vintage inks you sometimes see reviewed here. Edited by rickygene, 05 May 2015 - 02:02. I did a quick test for sheen. A scrap of Tomoe River Cream paper with a dip pen for maximum saturation. The photo was taken with a phone camera and artificial ( LED warm) light. I can see some reddish sheen which seems to be a characteristic of a lot of dark blue inks. I'm not sure how much sheen will be visible with a fountain pen under normal writing conditions. Thanks for the reviews. I like blue inks. There are so many good blues; this seems to be one of them.